Dozens of Haverford students and high school visitors for the weekend took advantage of a beautiful spring day on Founders Green to celebrate campus and community diversity in a multicultural festival. 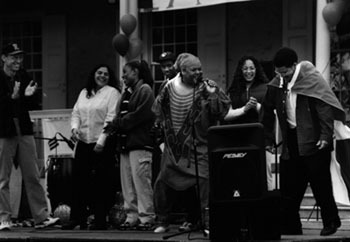 The day-long fair was organized by students who invited both the college and surrounding community for an event together. The festival featured performances by both student and professional groups including a bi-college Scottish dance troupe, "The Looney Tunes", the bi-college Filipino Cultural Group, the Puerto Rican band, "Pleneros del Batey" and "MINAS - Brazilian Music" from Philadelphia. Restaurants along the Main Line supplied Chinese and Mexican dishes and a number of student and community artists displayed their crafts. Katie Kibuuka '01, one of the festival organizers, says she was pleased with the event. "It was a way for us to have some fun with multiculturalism, and it enabled students to share some of their cultures with the rest of the student body, to show what they have to offer to the Haverford community."